Create a new cheesy vegetable soup every time. By adding different vegetables each time it can be anything from a Cheesy Broccoli Soup to Cheesy Asparagus Soup. The possibilities are endless, just let your imagination do the cooking. 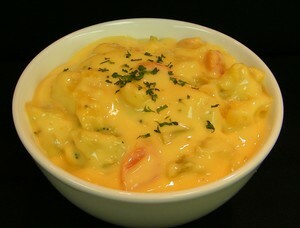 In a large crock combine 2 quarts Cream Soup Base (Crème Potage) and 2 quarts Three Cheese Mac & Cheese Sauce. Cover and refrigerate remaining gravy and cheese sauce. Add frozen vegetables to mixture to crock and stir to combine. Heat to 165° F for 30 minutes. Stir prior to serving. Tip: Make ahead to allow flavors to fully develop. NOTE: Cream Soup Base Mix (Crème Potage) yields 1 gallon of base. This recipe uses 2 quarts. Store remainder tightly covered in refrigerator for up to 5 days. NOTE: Three Cheese Mac & Cheese Sauce Mix yields ½ gallon (2 quarts) sauce.